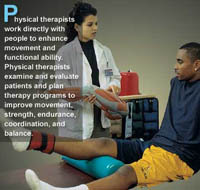 Physical Therapy (also called "PT") is way to treat, heal and prevent injuries and disabilities. Physical Therapy focuses on: pain relief, healing from injury , and recovering from disabilty. Other areas within physical therapy are ergonomic (body mechanic) training, exercise, fitness/ wellness, and injury education and injury prevention. Physical Therapy is treated by a physical therapist. 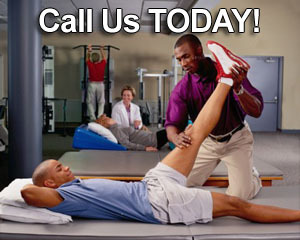 A Physical Therapist is a specialist in injury rehabilitation (rehab). Physical therapists are continually educated as to management for different dysfunctions, differentiation of one dysfunction/injury from another, and work closely with the referring physician in the development of a rehabilitation program specifically designed for a articular patient. A physical therapist, along with their trained staff, monitors each individual and attempts to correct improper movements, alignments and habits. What Can Optimum HealthCare Physical Therapist Do For Me?